The Fiat Research Center calls it the Panda because it’s small and cute, but the first thing I noticed about the hybrid fuel cell, electric car called the Panda Fiat, is that it shoots out water underneath it when it stops and starts. That’s a by-product of the fuel cell, and while we were driving the car around for our weekly episode of GigaOM TV’s Green Overdrive show, we managed to spray the street in front of the Battery Show in San Jose, Calif., quite a few times. 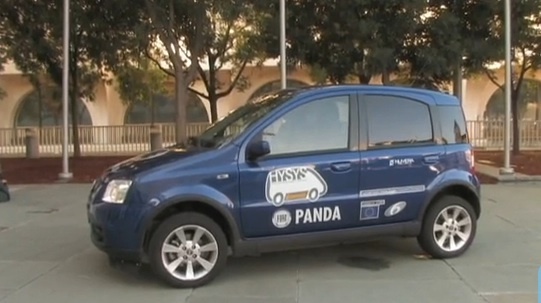 The Panda is just a prototype, but could lead to more real world research around fuel cell cars. Fiat calls this a Panda because that’s the platform they put the fuel cell/hybrid goodies into. They’ve been building a Panda for 30 years. The current version is several years old. And very popular around the world. Available with hp ratings from 54 to 100 hp. Engines running on propane, gasoline, diesel and natural gas.